While soccer is not as highly regarded in Canada as sports like ice hockey, you would be surprised to see the statistics. By estimate, over 5 million people in Canada participate in soccer at different levels every year. Soccer is a progressive development sport, and as such, it is important to begin developing players’ skills at an early age. Even the most talented players may not be able to exploit their full potential until they have racked up some experience. Soccer-known as football in many other parts of the world- can be introduced as soon as kids start running about, but the age of seven is regarded as the best to start teaching basic skills. Kicking is the most basic skill required by a soccer player. It is the action by which most of the game’s play activities are done- scoring, clearing, passing, dribbling etc. Basic as it is, it is a skill that needs a lot of specific practice to master. There are different types of kicks in a game- by the laces, in-foot, out-foot, back heel, chips etc., all of which need regular practice to master. Players also need to know how to weight each kick. Beginners should begin with the easiest kicks and the rest will come almost automatically. This basically teaches players how to receive the ball when it comes to them with speed. Remember that outfield players will not be allowed to handle the ball with their hands during games. Beginners start out with controlling the ball with their feet, including stopping kicks and making turns. As the skills set in, the drill graduates to controlling with other parts of the body like thighs, chest and the head. Juggling is always a great way to help beginners get comfortable on the ball and improve control. Dribbling is essential when players have to individually get away from or past opponents and advance towards goal. Even with good control, players will need to learn how to drive and weave the ball through barriers. Dribbling drills start with moving with the ball across an open space. Easy-to-maneuver static obstacles are then introduced. Eventually, more complex obstacles are introduced and eventually live opponents come into the picture. Even at the beginner level, players need to understand that scoring is the ultimate aim of playing soccer. Shooting is the means by which they score goals and it should be practiced from early on. Shooting drills begin with the easiest training of taking direct aim at an empty goal. It then advances to taking shots from different angles. Once this is mastered, players can then try more complex shots like taking shots when the ball is passed from out wide or increasing the distance between the goal post and where the shot is taken. Eventually, they can try scoring with a goalkeeper in goal trying to keep their shots out. However, beginners are not necessarily seven-year-olds. Even players older than that need to start by learning these skills if they are to become decent footballers. As the word states, the training is drilled, meaning it has to be practiced over and over in order to be mastered. 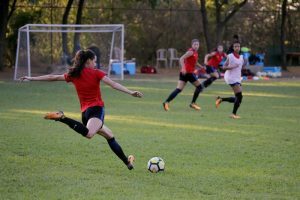 Soccer drills are important regardless of whether one is looking to become a professional or just getting in the sport for fun.